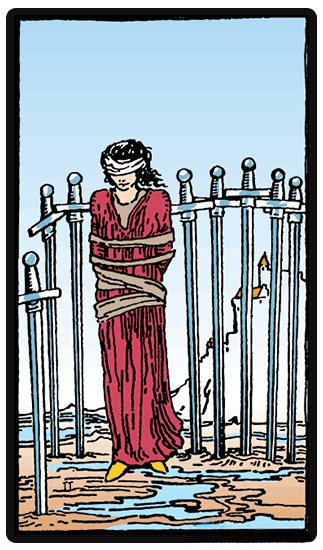 The general meaning in the Eight of Swords is that of a feeling of being trapped and victimized. You may feel powerless because, in your mind, you feel that changing the situation might be beyond you. This feeling of helplessness that you have, the feeling that you have no agency in your life, has played a major role in making your situation worse. Surrendering one s power to an unknown entity, whether it's fate, or God, the government or something else means that you are giving away your own personal responsibility to affect change. Surrendering one s power to an unknown entity, whether it's fate, or God, the government or something else means that you are giving away your own personal responsibility to affect change. You have willingly relinquished the driver's seat in the journey of your own life, and it isn't going well for you. It is advisable for you to avoid making an important decision at this time since your judgment is likely clouded. The good news is that because these traps are things that we create ourselves, we can also leave them if we put our minds to it. It is simply the matter of taking off the blindfold, and seeing beyond the limited perspective that we created for ourselves - to see the possibilities, and to recognize that you have your own internal power. Getting the reversed Eight of Swords is a good sign, since it shows maturity and self-acceptance, and a recognition of one's own power and responsibility - especially after a long struggle of doubt. It means that one is capable of making conscious decisions because they are confident in who they are, and their power to affect change in both themselves and the world. It's time to free ones self from the past and proverbially clear out their closet, creating room for new things and experiences.